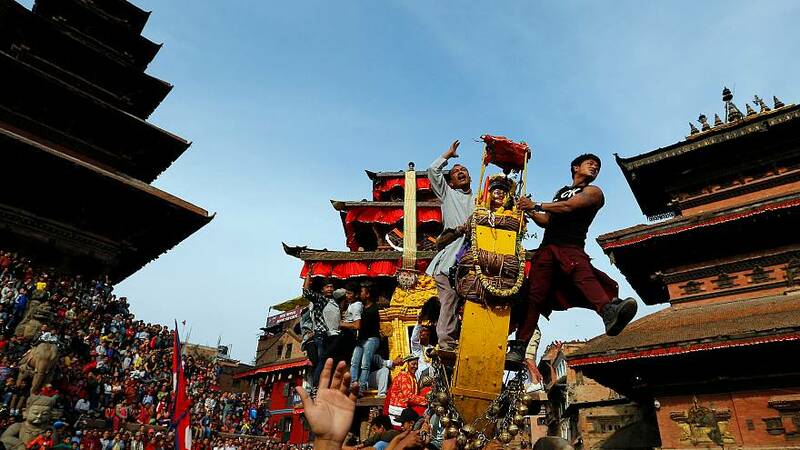 Thousands of people gathered on Sunday at the medieval city of Bhaktapur for the annual Sindoor Jatra, a festival that marks the beginning of the Nepali New Year and celebrates the arrival of Spring. People from villages around the town gathered in the streets, carrying images of several gods. During the celebration, they covered themselves with vermillion powder, played drums and danced and sang. This popular colourful festival is celebrated to thank the gods for the spring weather and pray for a good harvest during the upcoming monsoon season.